The National Highway Traffic Safety Administration states that in 2013, 10 percent of all fatal crashes, 18 percent of injury crashes, and 16 percent of all motor vehicle crashes were distraction-affected crashes. 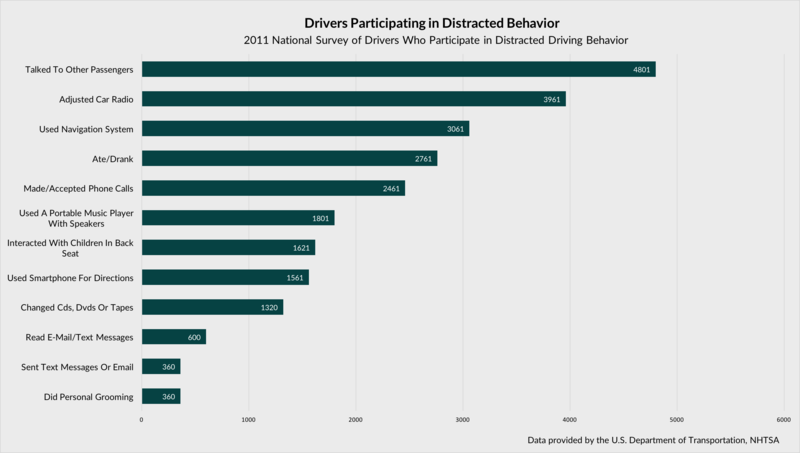 That said, vehicle crashes that involve distracted drivers are on the decline. In 2013, there were 3,154 fatalities caused by distracted drivers. This is a decrease of nearly 7 percent when compared to the fatalities recorded in 2012. However, there was a slight increase (0.7 percent) in the number of people injured due to distracted drivers. In 2015, the state of Kentucky experienced more than 53,500 crashes, which resulted in 169 fatalities and in excess of 14,000 injuries. All of these crashes occurred due to distracted driving. Although every kind of distraction can be dangerous to the driver and those around him or her, texting involves all three distraction categories, which makes texting and driving extremely dangerous. NHTSA states that when an individual texts while driving, he or she looks away from the roadway for approximately five seconds. Traveling at 55 mph, the distance traveled in that time totals the length of a football field. On April 15, 2010, Kentucky House Bill 415 became a law. This law bans drivers from texting while the vehicle is in motion. Drivers who are under the age of 18 are not permitted to use any kind of personal communication device while the automobile is moving. Although using a global positioning system is permitted, information can only be entered manually into the GPS when the vehicle stops. Drivers who are 18 and older are permitted to use a GPS as well as read, select or enter a name or telephone number to make a call. Carnegie Mellon University states that driving while using a mobile phone substantially reduces the brain activity associated with driving. Studies indicate this decrease is nearly 40 percent. According to the University of Utah, the use of a handheld or hands-free cell phone while driving changes a driver’s reaction time. This reaction time change is equal to the decrease seen in an individual with a blood alcohol concentration of .08 percent. The 2011 survey Mobile Device Use While Driving — United States and Seven European Countries states that 31 percent of the U.S. drivers surveyed between the ages of 18 and 64 reported that within the 30 days prior to completing the survey, they had sent or read text messages or emails while driving. If you were involved in a Louisville car accident and sustained injuries, you may be able to seek compensation. Please contact our office to schedule your free initial consultation today.